Win a BIOSTAR Motherboard in Our New Contest! Here at The Escapist, we appreciate all of our readers, and we like to give them the chance to win awesome prizes. That's why we've partnered with BIOSTAR to offer you all a chance to win a new enthusiast motherboard for your gaming PC. 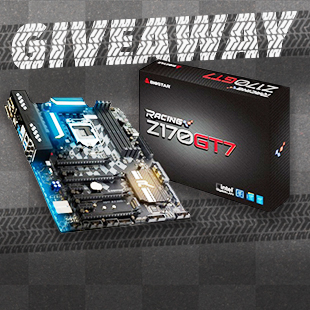 The grand prize is a BIOSTAR RACING Series Z170 GT7 motherboard, with some other prizes available to the runners-up, including backpacks, flash drives, and more. All you need to do is check out the contest below, fill out the form, and you'll be entered for your chance to win one of the great prizes provided by BIOSTAR. Don't forget to Like BIOSTAR on Facebook and thank them for providing these great prizes! The contest entries close on Sunday night, February 28, so don't delay. Get your entry in today! Thanks to the fine folks at BIOSTAR, we're giving away a slick motherboard for your enthusiast needs! The BIOSTAR RACING Series z170GT7 motherboard will jump start your gaming PC. You must be a registered member of The Escapist. You can sign up for your free account by clicking here, or Login with Facebook. Complete the form below and submit for entry. This is an international contest open to all readers. Answer this question in the text box below: "What are the 3 main models of the BIOSTAR RACING series?" All contest submissions must be in no later than February 28 at 23:59 EST for a chance to win. Beginning March 1st, winners will be drawn and notified via email. Thanks for your interest, but this contest is now over. Keep checking The Escapist for more contests and giveaways in the future. NO PURCHASE NECESSARY TO ENTER OR WIN. A PURCHASE WILL NOT INCREASE YOUR CHANCES OF WINNING. MUST BE THE AGE OF MAJORITY OR OLDER IN YOUR STATE, PROVINCE OR TERRITORY TO ENTER. INTERNET ACCESS IS REQUIRED TO ENTER. CONTEST IS OFFERED ONLY IN THE UNITED STATES AND THE DISTRICT OF COLOMBIA, UNITED KINGDOM, CANADA (EXCLUDING QU?BEC), AUSTRALIA (EXCLUDING NEW SOUTH WALES AND WESTERN AUSTRALIA) AND NEW ZEALAND. VOID WHERE PROHIBITED OR RESTRICTED BY LAW. 1. CONTEST. The objective is for participants to enter for a random chance to win the following prize (with a total retail value of Approximately $400USD ): Two Grand Prizes: BIOSTAR RACING Z170GT7 Motherboard,ThreeTier 2 Prizes:BIOSTAR Backpack and USB key.The winning entrants will win a prize as further set forth below. 3. HOW TO ENTER. To enter, visit http://www.escapistmagazine.com/contests/register/Biostarmoboand through the on-screen instructions, login to the Escapist website, wherein you will be asked to provide information including, but not limited to, your user name, email address, password, date of birth. Entries will be accepted between 3:00p.m. Eastern Standard Time ("ET") on 29 February, 2016 and 11:59p.m. ET on 28 February, 2016 (the "Contest Period"). No other methods of entry will be accepted. Sponsor has the sole discretion to determine the valid and official entry time should any discrepancies of time occur. Each entrant must submit their shipping information in full and pass the age of majority age gate (by submitting true and accurate information). No other methods of entry will be accepted. You may enter the Contest under one name and one email address only. Limit one (1) entry per person and per email address. Enter using only an email address subscribed and registered in your name. Entries generated by script, macro, robotic, programmed, or any other automated means are prohibited and will be disqualified. Obtaining multiple entries by opening or using multiple different email addresses is also prohibited and will result in disqualification of all that individual's entries. All entries become the property of Sponsor. 4. ENTRY CONDITIONS. By entering, you agree to be bound by these Official Rules and to accept as final and binding the decisions of the Sponsor and its agents in all matters relating to this Contest. Sponsor will use each winner's, and each entrant's, personal details for the purpose of administering this Contest. If you have opted in, the Sponsor (and its business partners if applicable) may also use the details you give us to contact you for marketing purposes by post, email and/or SMS. Please note that your data may be transferred and/or processed outside the EEA. 5. ACCEPTANCE AND CONSIDERATION OF SUBMISSION: Entries will be reviewed by members of the Escapist Magazine Team (the "Escapist"). The winners of the Contest will be selected from entries with all questions answered correctly once the contest has been completed. 6. DRAWING AND SELECTION OF WINNERS. The potential winners of the Contest will be selected based on following the entry rules and directions provided. The drawing will be conducted on or about 1 March, 2016by Sponsor or its designated representatives, whose decisions regarding all aspects of Contest are final. The odds of winning depend on the number of eligible entries received. The potential winners will be notified by PM on The Escapist to the Escapist account used during entry, within 15 days of the drawing. Sponsor is not responsible for and shall not be liable for late, lost, misdirected, or unsuccessful efforts to notify potential winners. The potential winners will be required to sign and return an Affidavit/Declaration of Eligibility and a Liabilities/Publicity Release Form (except in the United Kingdom and where otherwise prohibited by law) within 10 days of notification or attempted notification. Before being declared a winner, a potential winner must correctly answer, without assistance of any kind, whether mechanical or otherwise, an identification verification question to be administered by Sponsor or its designated agent by email or mail (at Sponsor's discretion) within the time specified by Sponsor. Potential winners who are Canadian residents must correct answer a timed skill testing question in order to be declared a winner. In the event that a potential Winner cannot successfully complete the identification verification question within the time specified by the Sponsor, then this will result in the disqualification of the potential winner and an alternate winner will be selected. By accepting and/or using prize, winners consent to the use of his/her name, voice and/or likeness for the purpose of advertising, trade, or Contest without further compensation, unless prohibited by law and upon request will provide such consent in writing. If a selected winner cannot be contacted, is ineligible, fails to claim the prize (by way of email or telephone) within 3 months from the time award notification was sent, or fails to timely return a completed and executed declaration and release as required, prize may be forfeited and an alternate winner selected. After three (3) attempts, if no winner is chosen, Sponsor will claim all remaining prizes to the extent permitted by law. THE RECEIPT BY WINNERS OF THE PRIZE OFFERED IN THIS CONTEST IS CONDITIONED UPON COMPLIANCE WITH ANY AND ALL APPLICABLE LAWS AND REGULATIONS. ANY VIOLATION OF THESE OFFICIAL RULES BY ANY WINNER (AT SPONSOR'S SOLE DISCRETION) WILL RESULT IN SUCH WINNER'S DISQUALIFICATION AS WINNER OF THE CONTEST AND IN SUCH CIRCUMSTANCES ALL PRIVILEGES AS WINNER WILL BE IMMEDIATELY TERMINATED. SPONSOR'S DECISIONS SHALL BE FINAL AND NO CORRESPONDENCE WILL BE ENTERED INTO. 7. IDENTITY DISPUTES. In the event of a dispute about the identity of the entrant, entries made online will be declared made by the authorized account holder of the email address submitted at time of entry. An authorized account holder is defined as the natural person who is assigned to an email address by an Internet access provider, online service provider or other organization (e.g. business, educational institution, etc.) that is responsible for assigning email addresses for the domain associated with the submitted email address. The potential winner may be required to provide Sponsor with proof that the potential winner is the authorized account holder of the email address associated with the winning entry. The winner may make no substitutions or transfer of the prize. Actual/appraised value may differ at time of prize award. The specifics of the prize shall be solely determined by the Sponsor. No cash or other prize substitution permitted except at Sponsor's discretion. The prize is nontransferable. Any and all expenses related to the winner's acceptance, possession or use of the prizes, including without limitation any and all applicable taxes and duties shall be the sole responsibility of the winner. Sponsor reserves the right to substitute, at its sole discretion, a prize (or component of a prize) of equal or greater value due to unavailability of a prize (or component of a prize) for any reason. 10. GENERAL CONDITIONS. By entering, each participant agrees (a) to be bound by these Official Rules and the decisions of Sponsor, which shall be final, and (b) to the extent permitted by law, that Sponsor, agents and representatives of Sponsor, its parent companies, affiliates, subsidiaries, officers, directors, employees, legal advisors and advertising, promotion, fulfillment agencies are not responsible for and shall not be liable for: (i) late, lost, delayed, damaged, misdirected, incomplete, illegible, unintelligible, postage-due entries, mail, or e-mail; (ii) telephone, electronic, hardware or software program, network, Internet, or computer malfunctions, failures, or difficulties of any kind; (iii) failed, incomplete, garbled, or delayed computer transmissions; (iv) any condition caused by events beyond the control of the Sponsor that may cause the Contest to be disrupted or corrupted; (v) any injuries, losses, or damages of any kind arising in connection with or as a result of the prize, or acceptance, possession, or use of the prize, or from participation in the Contest including without limitation, personal injury, death, and property damage, and claims based on publicity rights, defamation, or invasion of privacy; or (vi) any printing or typographical errors in any materials associated with the Contest. Sponsor reserves the right, in its sole discretion, to modify, suspend, or cancel the Contest at any time if the Contest is not capable of running as planned including if a computer virus, bug, or other technical problem corrupts the administration, security, or proper play of the Contest. Sponsor reserves the right at its sole discretion to disqualify any individual or entity it finds to be attempting to defraud or in any way tamper with the Contest or who fails to agree to or comply with these Official Rules. 11. GENERAL RELEASE. There are certain things for which Sponsor does not accept any liability to you, and these are explained in this paragraph. In the United Kingdom, the law does not allow Sponsor to exclude or limit its liability for some things, such as death or personal injury caused by its negligence, or loss caused by a false statement where the statement is made fraudulently, and in the United Kingdom, Sponsor accepts full liability for these matters. Otherwise, the exclusions of liability described in the rest of this paragraph will apply. BY ENTERING THIS CONTEST, ENTRANTS AGREE THAT SPONSOR, AND ITS PARENTS, AFFILIATES, SUBSIDIARIES AND ADVERTISING AND PROMOTION AGENCIES, AND EACH OF THEIR DIRECTORS, OFFICERS, EMPLOYEES, AGENTS AND ASSIGNS, SHALL NOT BE LIABLE FOR PERSONAL INJURIES, DEATH, DAMAGES, EXPENSES OR COSTS OR LOSSES OF ANY KIND RESULTING FROM PARTICIPATION OR INABILITY TO PARTICIPATE IN THIS CONTEST OR ACCEPTANCE OF OR USE OR INABILITY TO USE A PRIZE OR PARTS THEREOF INCLUDING, WITHOUT LIMITATION, CLAIMS, SUITS, INJURIES, LOSSES AND DAMAGES RELATED TO PERSONAL INJURIES, DEATH, DAMAGE TO OR DESTRUCTION OF PROPERTY, RIGHTS OF PUBLICITY OR PRIVACY, DEFAMATION OR PORTRAYAL IN A FALSE LIGHT (WHETHER INTENTIONAL OR UNINTENTIONAL), WHETHER UNDER A THEORY OF CONTRACT, TORT (INCLUDING NEGLIGENCE), WARRANTY OR OTHER THEORY. WINNERS RELEASE THE SPONSOR AND ITS AFFILIATES, SUBSIDIARIES AND ADVERTISING AND PROMOTION AGENCIES, AND ITS DIRECTORS, OFFICERS, EMPLOYEES, AGENTS AND ASSIGNS FROM ANY AND ALL LIABILITY AND RESPONSIBILITY WITH RESPECT TO A PRIZE (INCLUDING ANY PROPERTY LOSS, DAMAGE, PERSONAL INJURY OR DEATH). WINNERS ACKNOWLEDGE THAT SPONSOR AND ITS AFFILIATES, SUBSIDIARIES AND ADVERTISING AND PROMOTION AGENCIES, AND EACH OF THEIR DIRECTORS, OFFICERS, EMPLOYEES, AGENTS AND ASSIGNS, HAS NEITHER MADE NOR ARE IN ANY MANNER RESPONSIBLE FOR ANY WARRANTY, REPRESENTATION OR GUARANTEE, EXPRESSED OR IMPLIED, IN FACT OR IN LAW, RELATED TO A PRIZE (OR A PART THEREOF), INCLUDING WITHOUT LIMITATION AND TO THE EXTENT PERMITTED BY LAW, IN RESPECT OF QUALITY, MERCHANTABILITY OR FITNESS FOR PURPOSE. 12. USE OF PARTICIPANT, ENTRANT & WINNER NAME AND LIKENESS. Except where legally prohibited, by participating in the Contest, all participants, entrants and winners grants permission for Sponsor and those acting under their authority to use his/her name, alias, photograph, voice and/or likeness, for advertising and/or publicity purposes without consent or additional compensation. 13. WINNER RESPONSIBILITY. ALL APPLICABLE TAXES, LICENSES, TITLE AND/OR REGISTRATION FEES OR OTHERS COSTS, ASSOCIATED WITH WINNING THE PRIZE ARE THE SOLE RESPONSIBILITY OF THE WINNER. THE SPONSOR AND ITS AFFILIATES, SUBSIDIARIES AND ADVERTISING AND PROMOTION AGENCIES, AND EACH OF THEIR DIRECTORS, OFFICERS, EMPLOYEES, AGENTS AND ASSIGNS, SHALL NOT BE RESPONSIBLE FOR ANY SUCH TAXES, FEES AND COSTS. 14. MISCELLANEOUS. The Contest and these Official Rules will be governed, construed, and interpreted under the laws of the State of New York, United States of America. Entrants agree to be bound by these Official Rules and by the decisions of Sponsor, which are final and binding in all respects. Sponsors reserve the right, in their sole discretion and to the extent permitted by law, to change these Official Rules at any time without notice. Sponsor reserves the right, in their sole discretion, to disqualify persons whose eligibility is in question or for any other reason whatsoever or if Sponsor has grounds to suspect any entrant or third party of cheating, deception or fraudulent or unsportsman-like conduct of any kind (including, without limitation, manipulating the promotion, choice of prize winner(s) or any entry) Sponsor reserves the right (in its sole discretion) it may disqualify any entrant, entry or person it reasonably believes to be responsible for, or associated with, such activity. 15. WINNER'S LIST AND OFFICIAL RULES: To obtain a copy of the Winners List or a copy of these Official Rules (which can be found online at http://www.escapistmagazine.com/contests/register/Biostarmobo), mail your request to: ESCAPISTMAGAZINE.COM BIOSTAR RACING Z170GT7 CONTEST 2016Contest Winner's List, c/o Defy Media, LLC, 406 Blackwell Street, Suite B020 Durham, NC 27701, United States. Requests must be received no later than1 September, 2016. Damn. I could use something shiny like this so I can finally join the PC Master Race (namely because I want to play XCOM 2) but I hate liking stuff on Facebook like that. Oh, they're Intel boards. Thanks for including Australia, but nevermind. Nice I can participate :P, you might want to fix that. Can't avoid to kinda smile at this misspelling since everyone keeps spelling the name of the country as Columbia. Ew....a Facebook liking contest. I dislike it already. Okay, bye. Ha, Biostar. They don't even have a market here where I live. Most people would pick ASRock over them anyday. No, these are not fun. They aren't even giveaways. They're marketing schemes, all of them. 2. Do research on the company (that you've probably never heard of before) in order to answer their quiz. To top it all off, by entering the contest, you've given them the right to use your name, likeness, voice, picture, and alias without consent or additional compensation. That's not even if you win. All participants sign that right to privacy away, except where legally prohibited. Not to mention all the people they will probably be selling your personal information to. This isn't a "giveaway". This is a profit for The Escapist and a profit for BIOSTAR. This is an ad. As a pub club member, I don't want to see ads. I paid not to see ads, did I not? They should be removed from my view like the rest of them. If they really want to do a real Giveaway, they'd allow you to opt-in by clicking a button, and then send you your prize if you've won. That's it. That's what a giveaway is. No facebook likes or tweets or researching companies that are 18x smaller than Nvidia needed.